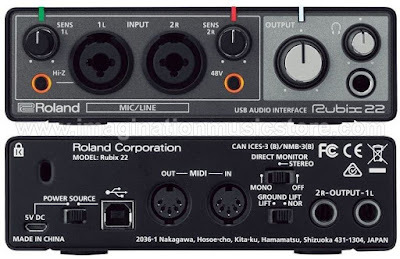 The Roland Rubix 22 is a 2-channel USB audio interface that's perfect for mobile recording, even in less than ideal environments. Class-compliant USB and USB bus power make the Rubix 22 a perfect companion for your laptop or iPad, and it's built tough enough that you can toss it in your bag and go. Two low-noise microphone preamplifiers benefit from extensively shielded construction, both of which ward off noise beautifully. There's also a universal ground-lift switch that lets you kill 60Hz AC hum, plus MIDI I/O lets you connect keyboards and controllers. A copy of Ableton Live Lite DAW software (Mac/Windows) completes the package.